This part of England is called the “English Riviera” and I am learning why. 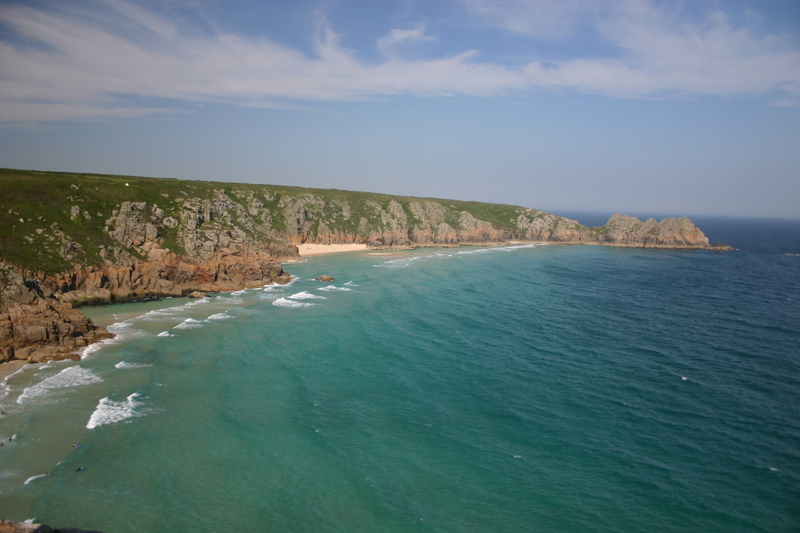 Its coasts are just magnificent! After a relaxing morning and a swim, we decide to battle the car again. Now you may think we’re nuts, and so do we sometimes, but there is so much to see. And we have learned to give our three year old a dose of Dramamine before leaving; car sickness averted. We arrive in Penzance for a late lunch. I don’t really know anything about Penzance except for Gilbert and Sullivan’s The Pirates of Penzance. No pirates, but a cute harbor town, so after a couple delicious Cornish Pasties we have a nice sea side walk. 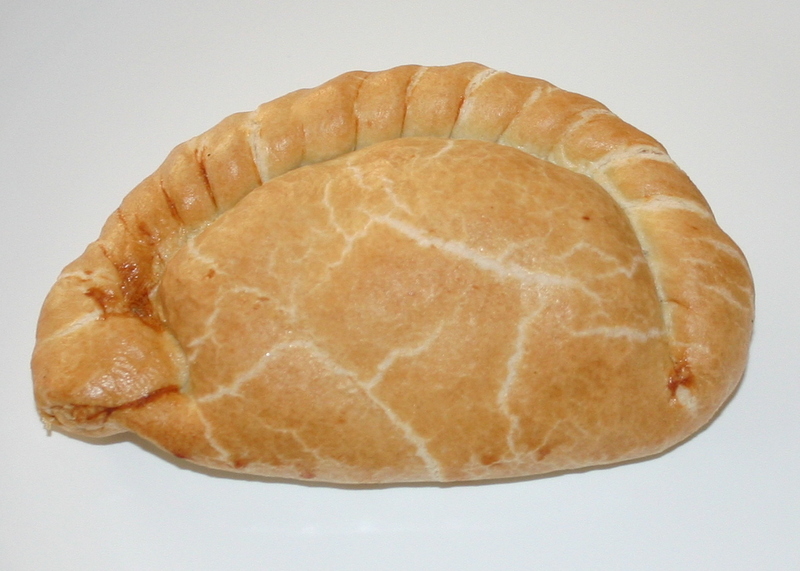 So if you don’t know the story, a pasty is a delicious pastry filled with savory mixes of beef, potato, onion and rutabaga, but can also be made with other meats, vegetables, cheese, and spices. According to my research, a proper pasty’s ingredients are never cooked before wrapping them in the dough; this is how they differ from an empanada. Coming from Michigan my husband thought they were Finnish as he’s telling me the story of the Finns bringing them to Michigan. But we’ve discovered they actually came to fame by Cornish Miners in the 16th century. If you see the photo, you’ll see a large curved crust end (my favorite), developed that way so the miners could hold that part with their dirty, contaminated hands and eat the rest. When finished, they threw down the thick crusted edge part, now toxic from their mining hands, and it is said this would keep the spirits at bay who could lead the miners to danger. A shame, I think, they used to throw out the best part! Anyway, because it was the Finns who followed the Cornish miners in the late 1800s to the Upper Peninsula of Michigan, and adopted the pasty for use in the copper mines, we have the legend that pasties are a Finnish invention. 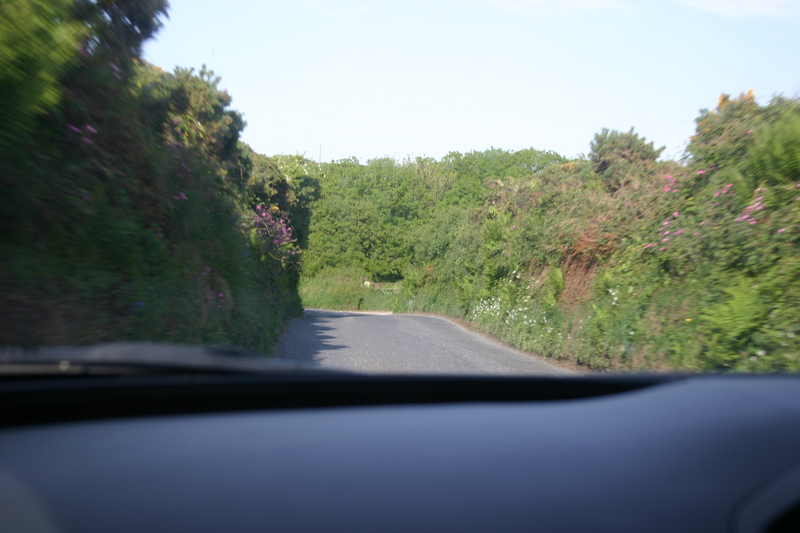 From Penzance, amongst some of the curviest and narrow roads imaginable, we drove out to Lands End, nine miles away and the farthest point East you can go in England. 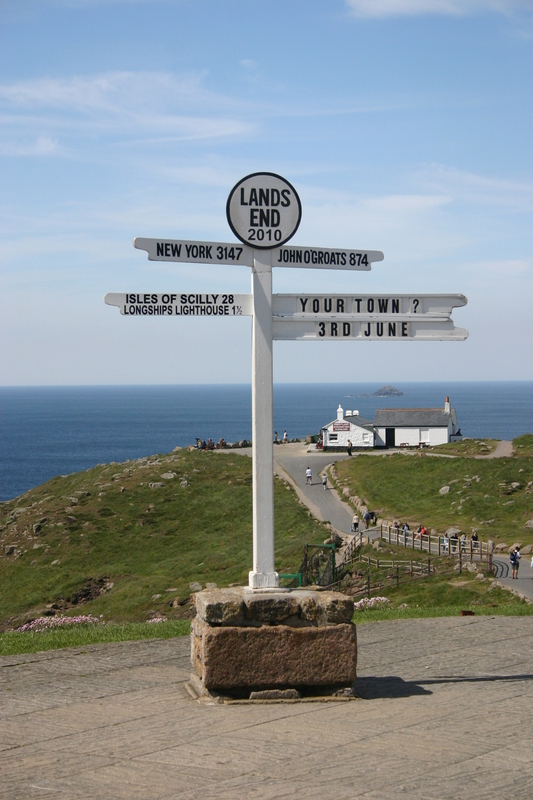 Just the name – Lands End – has had my curiosity since we’ve been here. 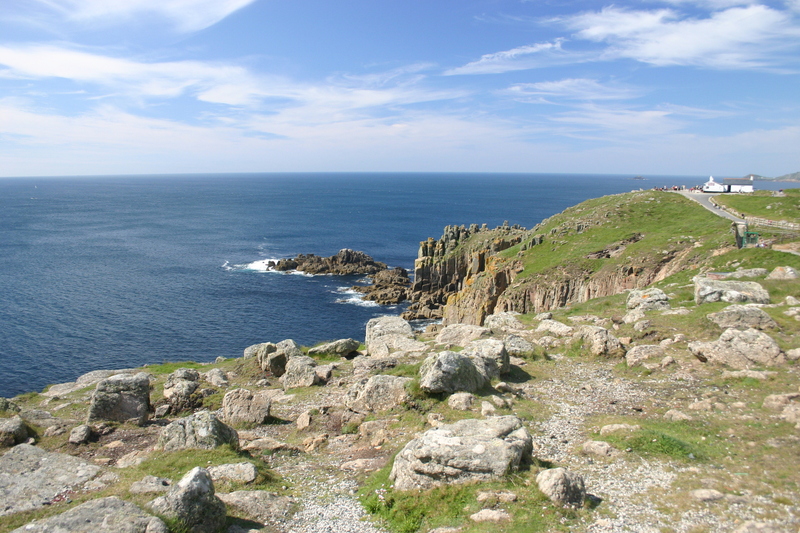 We passed by The Last Inn in England, an actual inn where travelers can stay, just before reaching Lands End. We arrived, paid to park, and set out to see the coast. My husband’s co-worker had warned him it has been a bit built up as a tourist trap in recent years, but I wasn’t really prepared to find what I’ll liken to Mackinac Island-style gift shops, ice cream, and fudge stores, etc. Yes, it is commercialized, but you still can’t beat the beautiful coast line views. 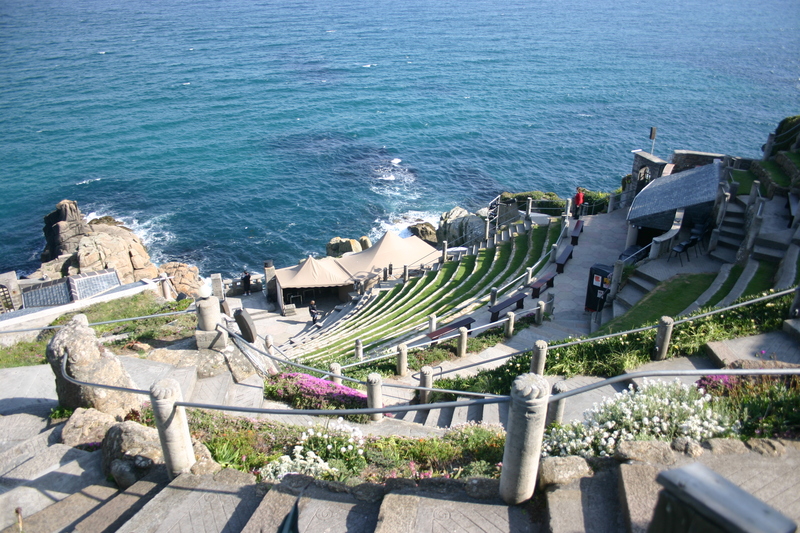 Next stop was the Minack Theatre, an amazing Greek style theatre where the ocean is its backdrop. 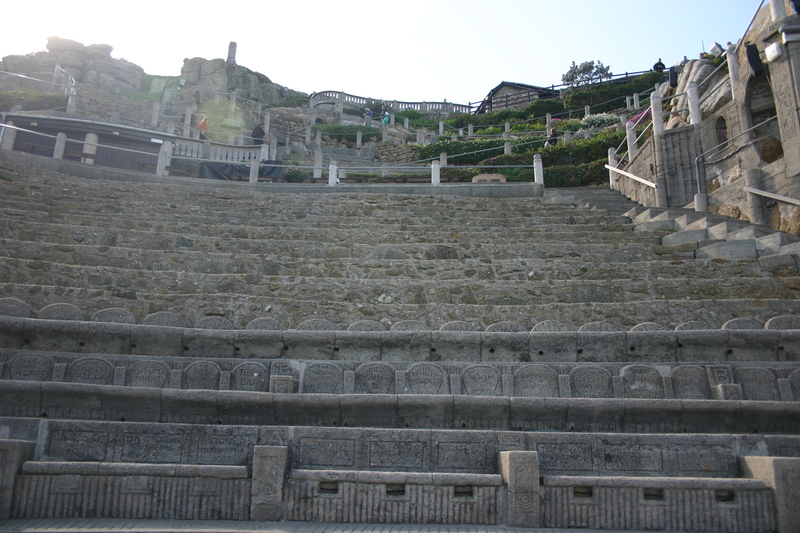 We arrived around 5:00 pm and show-goers were just lining up with their picnic lunches and wine, for the 7:30 show. Sounds like an amazing thing to do, sans children, someday. We were also lucky to try “Cornish Cream Tea” which is a pot of tea, scones, jam, and clotted cream, this yummy yummy buttery like (and undoubtedly artery hardening) substance. I’ll try my best to describe: picture fresh whipped cream but whipped slightly less so it’s a more buttery substance with less (or no) sugar. You spread it on scones, with or without jam. It really is one of the best food items I’ve sampled in quite a while. 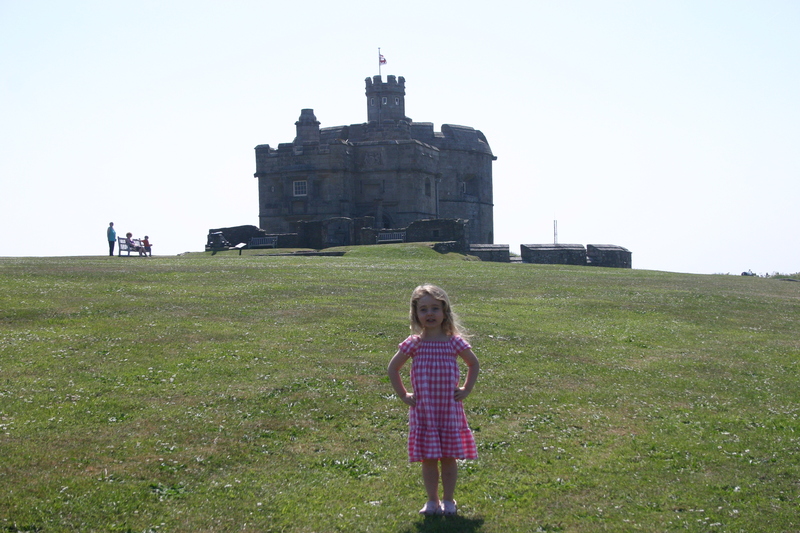 Next day, we spent the better part of the morning exploring Pendennis Castle, built by King Henry VIII around 1540 to keep both France and Spain at bay. It was built up again by Queen Elizabeth I during her reign to keep off foreign invaders, and was used as a defense as recent as World War II. I was impressed with how much we could see. Virtually every room of the castle was open to visitors. 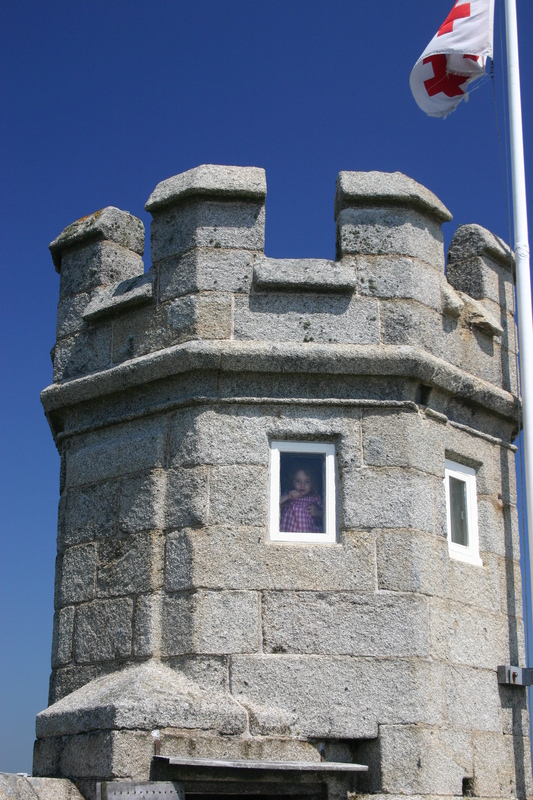 You can faintly see my daughter’s face through the tower’s upper window in the photo. By afternoon it was time to make our way back up to Devon so that we could catch our return train to London the next day. This time we managed to stay on the correct route, at least as much as is possible, and averted crying and car sickness, having learned much from our week long travels. 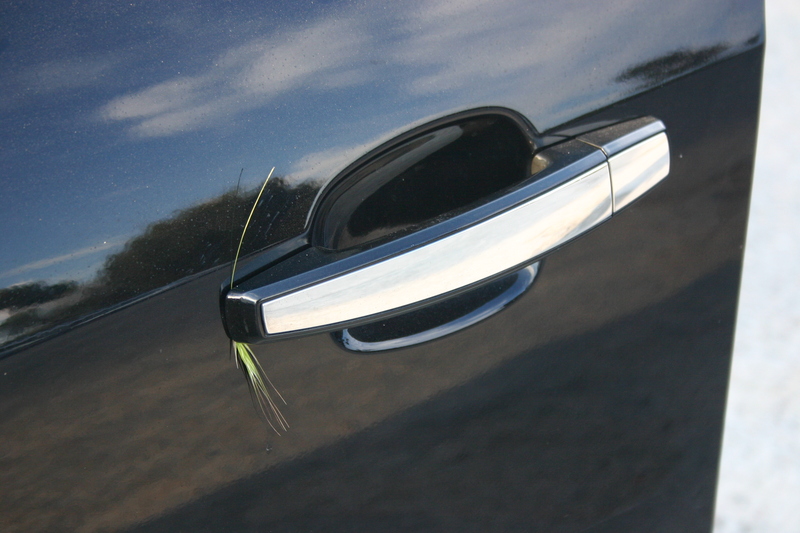 But before returning our rented car, we had to giggle at the brush stuck in the passenger’s side door handle…those really were some narrow roads! Again, I love reading all of this–is that a trip we should make?